Washing dishes is a bothersome chore that many put off until the last minute. Since dishwasher detergent is often stored out of sight under the sink, homeowners might not notice when they're running low. 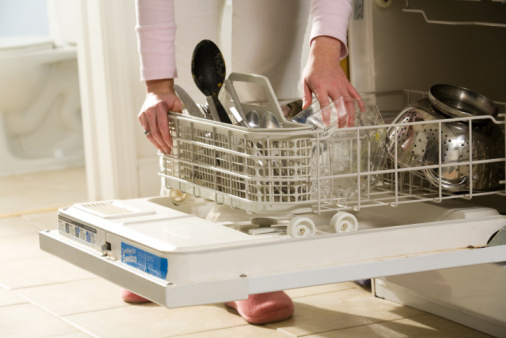 Unfortunately, replacing dishwasher detergent with commercial laundry detergents or other soaps can cause excessive suds and make your dishwasher overflow. If you find yourself with a lack of clean dishes and dish soap, you can make a quick homemade detergent using washing soda. Washing soda, or sodium carbonate, is a natural product found in some laundry detergents, and is a main ingredient in homemade laundry detergent recipes. You can find washing soda in the laundry aisle of some grocery and natural products stores. Use washing soda to make homemade dish detergent. Mix washing soda and borax in a plastic container until well combined. Mix in two or three drops essential oil if you want a fresh citrus or floral scent. Add 2 tbsp. of the mix to the detergent compartment of your dishwasher. Pour vinegar into the rinse compartment to prevent cloudy residue on the dishes. Run the dishwasher as normal. Place a lid on the container and store it.